Steering column lower mounting frame gasket. Triangular shape with mounting holes and column tube clearance. 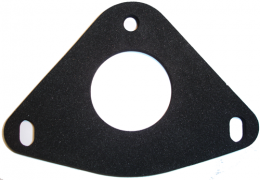 Die cut to exact dimensions from 3/8" sponge rubber. Replaces original GM part #1456122. Sold individually. MADE IN THE USA.